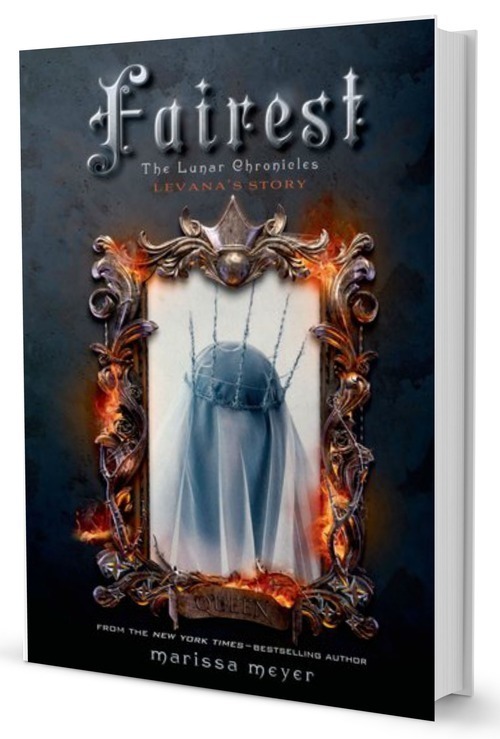 Fans of the Lunar Chronicles know Queen Levana as a ruler who uses her “glamour” to gain power. But long before she crossed paths with Cinder, Scarlet, and Cress, Levana lived a very different story – a story that has never been told … until now. My initial thought upon finishing Fairest : Levana is insane and I love it. This novella is really more of a character study of Levana, and is hard to talk about it without spoiling the book and the entire series, so read it at your own risk. It doesn’t advance anything in the main plot, but it gives a hint of what to expect from her. Nothing will stop her from achieving her goals. I love that she wasn’t redeemed. That she wasn’t even the least bit justified in her actions. Of course, this is from her point of view, so she thinks that everything that she is doing is for the sake of Luna. She has become so caught up in her desire to control everything and everyone, that she doesn’t even realize what she is doing anymore. Throughout the story she reminded me a lot of Cersei Lannister from A Song of Ice and Fire series. Levana has a twisted way of perceiving love. She is manipulative, vindictive and cruel. She has suffered most of her childhood at the hands of her parents and her sister, and her outward ugliness encouraged her to perfect her glamour. But in doing so, she has lost track of who she really is and of what it means to be loved. So she manipulates the man she loves and she controls the people of Luna, she uses her glamour almost desperately in an attempt to make those around her adore her. She is jealous of her sister, because she believes she is more fit to be a queen, but her circumstances have prevented her from doing so. She secretly hates herself and she has a lot of internalized misoginy, she hates other women, especially those she consider beautiful and/or weak. Channary isn’t better than Levana in any way; she is cruel and careless. She throws her own sister in the fire and the fact that she seems to care for her baby daughter doesn’t redeem her in my eyes. She is just as vicious as Levana. I said it is more of character study, but it still has some plot and a very interesting one, of how Levana became Winter’s stepmother. A lot of the stuff that happen were already acknowledged by the rest of the series, but it was nice to wrap up how it all came together. In the end, I really enjoyed this. I like character studies, I like villains. I enjoyed the fact that Levana was a full villain, motivated by nothing more than her own madness and desire for power (even if those were shaped by certain tragedies on her past). I believe that strong female villains are just as important as heroins or anti-heroins. We want female characters of every shape and form and this story, as is the entire Lunar Chronicles series is a step in the right direction. Bonus: The first four chapters of Winter are amazing already and the pain of the wait has officially begun! YES! If you are a fan of the series this is a must have/read, as are the other short stories companions. While not adding anything and not being necessary to the comprehension of the main story, this is still an enticing read. Personally I adore this series and will read anything to do with this world and its characters. It is also a really quick read. If you haven’t read the series up until Cress yet: DO NOT read Fairest. It should be read in publication order, because SPOILERS. I need to buy this entire series in hardcover because the covers are gorgeous and especially this one, because the beautiful illustration wasn’t available on the ebook. See this link. Have your read Fairest yet? What did you think? If not, are you interested? Are you a fan of The Lunar Chronicle Series? Do you like stories about true villains or prefer the typical hero’s stories? This wordpress is more of a backup blog.